Searching for a classic nylon dog leash in a lovely hue? 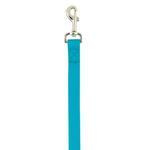 Look no further than our Zack & Zoey Nylon Dog Leash in Bluebird! Add some durability and classic style to your walks with our Zack & Zoey Bluebird Nylon Leash. 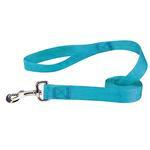 This turquoise blue nylon leash will be a staple for any dog or cat's walking wardrobe. Each leash features a nickel-plated swivel clip for a quick and secure attachment. The turquoise blue color will go with anything and is a great choice for spring and summer events. This leash is perfect for supporting your favorite sports teams that feature turquoise blue such as the Carolina Panthers and the Miami Dolphins. You will love the classic design of this nylon dog leash in Bluebird. Available in multiple colors. Matching collars and dog harnesses are available too. New! Now smaller dogs and cats can enjoy more freedom with our 5/8" x 6' leash! Zack and Zoey Nylon Dog Leash - Bluebird Customer Photos - Send us your photo! He looks so cute in this colour! Posted On 06/11/17 by Terri P from , Yes, Terri P recommends this product! This leash is a lovely shade of blue with almost a satin look to it. It is strong and sturdy with good quality hardware that should last a long time. Highly recommended! Posted On 05/03/17 by Marilyn F from , CA Yes, Marilyn F recommends this product! I went a day without using the leash because I could not figure how to get it out of the black holder. It had what looked like black lumps with screws, but they were not screws or anything that seemed to move. When I tried to call Baxter Boo about 4:30 my time (CA) it was closed. And the next day I could not find anyone "young" as it turned out. Finally, my neighbor's son (age 24) took a scissors to the black plastic and opened it. I was unable to get a scissors to do the trick a couple days earlier. Either have Zoey & Zack enclose directions or make an easier opening leash holder. Posted On 05/02/17 by Patty H from Nixa, MO Yes, Patty H recommends this product! Actually this leash is being returned. I didn't realize how heavy the clasp would be on the wider width leash. I have since ordered the more narrow leash with smaller, lighter clasp. It will be perfect for the matching harness & collar ordered for a new puppy. All these will be perfect for her training months. True blue to match the collar. Posted On 04/23/17 by Janice W from Hallettsville, TX Yes, Janice W recommends this product! This leash is a perfect match to the collar I bought. And the 4 ft. length is perfect for me. With coupon codes and a birthday gift certificate for my dog, the leash and collar were very afffordable. I bought the bluebird leash so that my poodle Paris would have a leash to match her Aruba harness. She needs to have color coordinated outfits. Posted On 12/09/16 by Joyce J from Sarasota, FL Yes, Joyce J recommends this product! I have several of these in different colors. Posted On 12/05/16 by Joyce J from Sarasota, FL Yes, Joyce J recommends this product! I have them in several colors. Good leash for the price. Posted On 06/16/16 by Lisa G from Lubbock, TX Yes, Lisa G recommends this product! I have been looking for a turquoise/aqua colored leash for a while to match a custom collar my dog wears and this one matches perfectly and at a great price in the 4 foot length I wanted - thanks Baxter Boo! Posted On 04/25/16 by Jennifer C from Pittsburgh, PA Yes, Jennifer C recommends this product! Posted On 10/12/15 by Pat from Saugerties, NY Yes, Pat recommends this product! A great light weight leash for a small dog. Posted On 07/27/15 by Linda C from Riverside, RI Yes, Linda C recommends this product! Sturdy and perfect length. Will last quite awhile. Posted On 07/14/15 by Lacy J from Aurora, CO Yes, Lacy J recommends this product! I absolutely love that I can Finally match my dogs collar, leash, and harness in a fun color! Posted On 06/24/15 by Debbie K from Marietta, GA Yes, Debbie K recommends this product! Maggie's leash matches her new harness so well! Sturdy leash with solid clasp. Great colors that match the collars. Posted On 01/13/15 by Emily S from Columbus, OH Yes, Emily S recommends this product! I bought this leash because it is close to tiffany blue. It was exactly as pictured and described. Posted On 12/03/14 by Linda P from Homewood, IL Yes, Linda P recommends this product! I've been looking for some time for a 4 foot length leash to match my dog's harness. This is perfect and reasonably priced. Such a pretty color, and great 6' leash! Posted On 01/03/14 by Laurel from Boise, ID Yes, Laurel recommends this product!